Mahjong Solitaire is the single-player version of an ancient Chinese game that was originally played with four players. 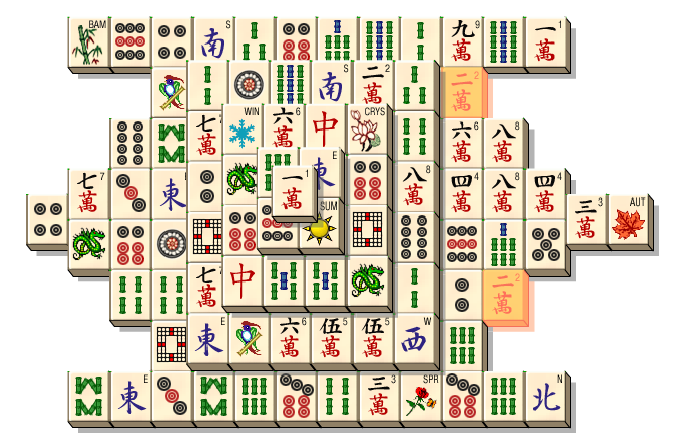 While many variations of traditional Mahjong exist—each with slight differences in their rules—the guiding principles of the game remain the same. To succeed, you must use skill and strategy to create pairs of matching decorated tiles. Similar to card games such as rummy, a player depends not only on skill, but also luck to have the right tiles to win the game. 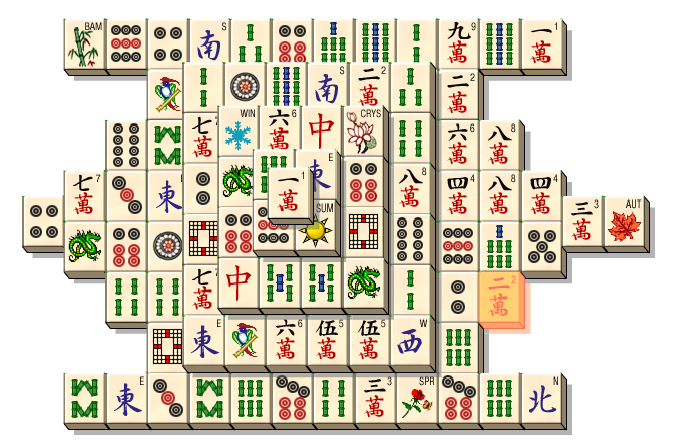 This version of Mahjong Solitaire is played with a set of 144 tiles that are decorated with colorful images. Each unique image appears on four of the tiles. To start, the tiles are stacked and arranged into a three-dimensional tiered layout with their images facing up. To win the game, you must clear the entire board by matching like tiles and removing them from the board in pairs. Tiles can be removed from the board by matching pairs of free tiles. A tile is considered “free” when its left or right side is not blocked by another tile and there is no tile covering it on top. 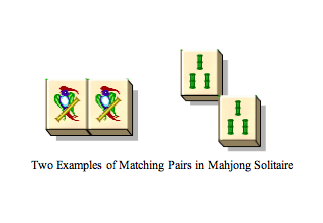 A matched pair is made by selecting two tiles that are decorated with identical images, such as a colorful bird or three pieces of bamboo. The game is won when all of the pairs have been matched and the board is cleared of tiles. The game may alternately end when there are no more possible matches with the available free tiles. If no more matches can be made, this means the game is blocked and cannot be won. The tiles will then be automatically removed from the board. Removing these tiles will free up more of the tiles to be matched. If one of the tiles was on top of a stack, the tile below it in the stack will now appear. If one of the tiles was at the end of a row of tiles, then the next tile in the row will be freed on that side. The new tile at the end will now be free to be part of a pair, only if there is not another tile overlapping on top of it. If you decide not to match a tile once you have selected it, click on it again and it will be deselected. You can then select another tile. Continue matching pairs and freeing more tiles until you have removed them all or until you receive a message that there are no more possible matches. Study the layout of the board, especially the long rows or high stacks of tiles that may be difficult to clear. Evaluate present obstacles, such as two matching tiles next to each other at the end of a long row. Because the tile on the end is blocking the tile next to it, it will be hard to remove them until you have found a third matching tile. Alternately, you must work from the other end of the row to free the inside tile and create the pair. Plan out future matches in advance so you know which tiles you should remove first. Pay attention to which tiles you will free with each move, planning ahead so that more matches can be made with each removal. Often one tile is blocking several others and removing this tile will allow many other matches to be made. Look for the matching tiles to the tile that is blocking several others, and if these matching tiles are not yet free, plan the best way to free them. Be careful if you see two matching tiles overlapping each other. These can never be matched together because you cannot select the tile on the bottom when the other tile covers it. You must match the tile on the top with another one of the three tiles with this image. If you match the two other tiles in this set and leave the two overlapping tiles, you will never be able to remove that pair and the game will be blocked. It can sometimes be difficult to plan your moves ahead when there are tall stacks because a number of tiles remain hidden in the bottom layers. Try to remove tiles from the top layers because they not only free more tiles but also reveal the tiles below, allowing you to plan your future moves more wisely. If there are four free tiles with matching images, pair them right away to help clear the board since you will not need them for any future matches. This is always a good move, as it will help you clear the board of tiles and free new tiles. If three matching tiles are free, carefully choose which two you want to remove, especially if you see that the fourth is blocked by many other tiles. The fourth may not be free and available to match until much later in play. If two matching tiles are free, it’s not always best to match and remove them immediately—you may want to keep them on the board and use one to make a match with another tile that opens more possibilities later. Ultimately, try to remove pairs that will free the most new tiles and allow more matches to be made. If a tile is sitting by itself and removing it will not free any other tiles, it is not necessary to remove that tile right away.